Ferrets are active little critters who need an outlet for their energy. Watching yours scamper around may have you considering getting him a hamster wheel. After all, if you've ever had hamsters you know the little guys put in a lot of hours and log a lot of miles on them. While you're on the right track when thinking of exercise for your weasel-y little pal, a hamster wheel isn't the best solution. Hamster wheels work great for hamsters, but your ferret won't use one as it's meant to be used and probably won't appreciate it the way a hamster does. First of all, even the biggest hamster wheel you can find won't be big enough for your ferret, regardless of how flexible he is. Additionally, although ferrets are busy and stay active most of their waking hours, they are far too curious to get on a wheel and run to nowhere for hours on end. If you put a hamster wheel in your ferret's condo, it might intrigue him, but he would be more likely to play with it than play on it. You still need to facilitate exercise for your ferret. Not only does exercise keep him in shape but it stimulates his keen little mind, as well. 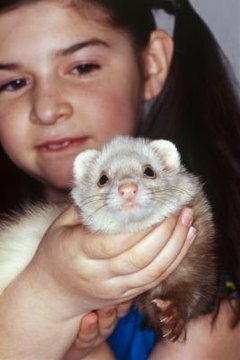 Games of chase, tag and pouncing are great fun for ferrets and if yours is an only ferret child he'll probably recruit the dog, cat or other family member to play along -- willingly or not. Ferrets like to climb just as much as they like to run and jump, so your little guy will enjoy it if his condo includes cloth covered objects he can scale and multiple levels attached by ramps that he can climb. When you visit the pet supply store you'll have a large selection of ferret toys to choose from like ferret balls for hiding and exploring, chew toys for gnawing, trampolines for jumping and bouncing and tubes for tunneling through. You could easily spend a fortune but probably you already have toys at home that your ferret will enjoy just as much. He'll probably steal a few items from your dog and cat like chew toys and crinkly sacks. Even things like ping pong balls and empty shoe boxes and cereal boxes are toys prized by imaginative little ferrets. All your "kids", the ferret included, can get into trouble if you don't take precautions with their toys and their habitats. Use sisal and cloth covered ramps instead of carpeted ones as their little claws can catch on the carpet fibers. If your ferret is still a baby, don't provide him with climbing opportunities just yet as he can hurt himself if he falls. Don't give your fuzzy little friend toys with buttons, feathers, pompoms, leather, rawhide or any toy that can be chewed, swallowed or dismantled because that is exactly what your ferret will do with it.